Probably one of the challenges I was least looking forward to completing in my 2015 Reading Challenge was #20 A book at the bottom of your to-read list. My TBR stands at well over 100 books, so how was I supposed to pick the book I least wanted to read? Technically, the book I least wanted to read, I started reading in 2013. 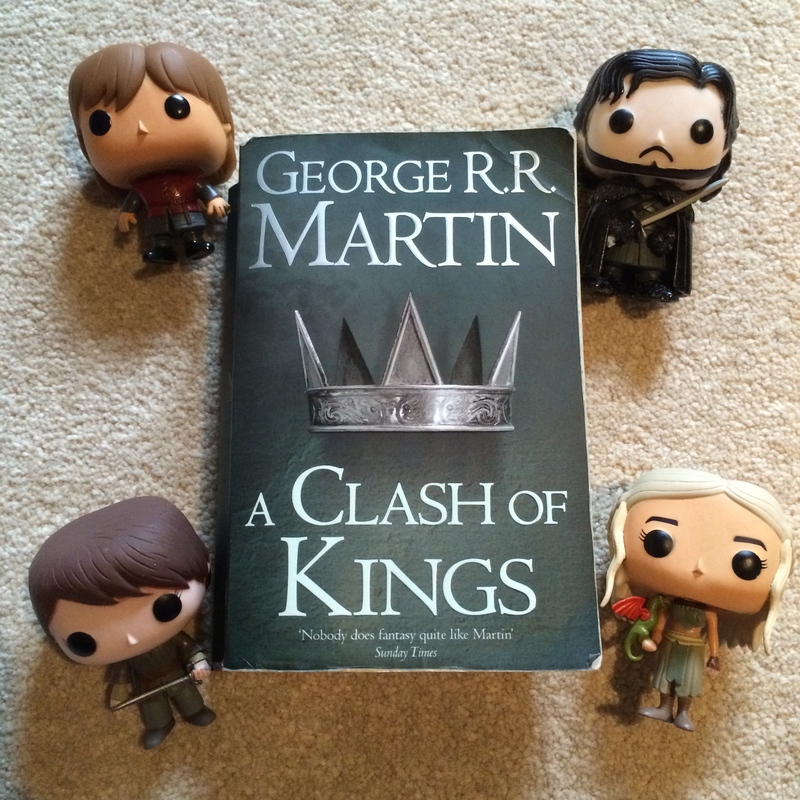 That book, “A Clash of Kings” by George R.R. Martin. All 911 pages of it. I don’t usually have a difficult time getting into books, but if we’re talking about how long it took me to read “A Clash of Kings” from the first page until the last page, it took me 19 months to read this book! 19 months! That has to be some kind of a record. “Where on earth do I begin? I thoroughly enjoyed ‘A Game of Thrones’, the first book in the series, and (rather naively) believed that I would enjoy the second instalment just as much. I was wrong. Where ‘A Game of Thrones’ was rife with character development and action, ‘A Clash of Kings’ was distinctly lacking in the action, and the character development was slow. I am however incredibly thankful that this book is told from the perspectives of approximately 10 different characters, or I’m not sure that I’d have finished this monster of a novel. At times I did very much enjoy this book (those occasions were primarily when I was listening to the audiobook, which to its credit is fantastic) but more often than not, it felt like a chore! The title really couldn’t be further from the truth. The vast majority of the time, the characters were walking or whining or worrying, with very little in the way of axe-wielding. Will I be continuing on with the series? It is not a priority of mine. I will catch up on the TV show, and if the mood strikes me, I may well pick up #3, and pray to the old gods and the new gods that it is better than this volume. It was dull, dry and, at times, downright dire. Before we go any further, can we talk about the insane cuteness of my Pop Vinyls please?! Thank you. Maybe now you’ll understand why it was at the bottom of my TBR list. At least now I’m not concerned about reading the books before I watch the TV show (as I won’t be doing that!) Part of me believes that this novel is yet another prime example of Second Book Syndrome, but given the hundreds of thousands of positive reviews, I know I must be in the minority of people who didn’t really enjoy this nook. Am I’m missing something?